Last year the Demons supplied us with a fantasy hero in Dom Tyson, in 2015 we have one that could be even better in value. Click here to see prices update on AFL Fantasy Pulse. Nathan Jones: Season 2014 was by far his best fantasy year, for the first time ever he averaged over 100. To get him you’ll be praying some chunky coin with $572,000 departing your salary cap to own him. 11 of his 22 games saw him score 100 or more, and only 4 times did he score less than 90. Heritier Lumumba: After transferring from the Pies during trade period this Def/Mid will set you back $402,000. Last year he dropped 15 points from his 2013 average and a change of scenery may see him back into the high 80’s averages. If that’s the case he presents some handy value. 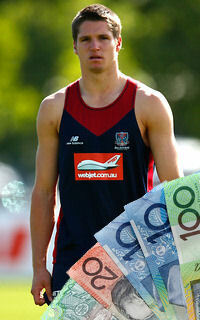 Angus Brayshaw: These high draftees are pricey and this years pick #3 will cost you $294,000. Although cheaper options are around with the likes of Stretch ($170K) and Neal-Bullen ($176k) your paying for job security with this rookie. Averaged over 20 touches in both the TAC & Under 18 championships. He has some similar traits to Joel Selwood and Ollie Wines and if he can deliver debut seasons like those two, then he’ll be worth every cent. Christian Salem: From a straight midfielder to a forward this youngster has a crazy set of skills at his disposal. Last years 13 games at an average 31 although poor at first glance this was heavily vest affected for many of his games. Thankfully these vests have heavily reduced his price were he’s a potential bargain at $193,000. In 2014 a round 11 showing against the Power were he chalked up a 79 shows his scoring potential when given a full game. 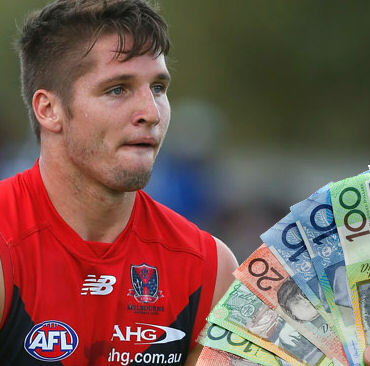 Jesse Hogan: Taken in one of the mini drafts and sadly missed the entire 2014 season. Last years pain though is this years reward for fantasy coaches with this imposing kid now priced $194,000. In his full season in the VFL in 2013 (he was ineligible to play in the AFL) he won the best & fairest for Casey where he averaged 14 touches, 6 marks and 2 goals at an average above 70 fantasy points. That’s pretty darn handy priced under $200K. Seriously he’ll be one of the best locks of the season. PLEASE NOTE: If viewing on a mobile device, turn it to ‘landscape’ mode to view all contents of the table. Ben Newton at under $200K has to be monitored. He’s on the watch list for the Warne Dawgs. My watch list is getting longer. With every team prices list that has been released. We are only 2 teams in too. Granted we’ve had some very relevant options. some teams I’m very excited to see in Richmond & Collingwood. 572k for a Melbourne player lol. Yes prices are a joke. the 100k per average of 20pnts has been thrown out the door.. Lumumba avgd 71 and priced at 402k. I have put Jesse Hogan on the field in FWDs and Lumumba in DEF. My watch list includes Vandenberg/Brashaw/Petracca and Salem. I was not even going to consider the high priced new kids but Warnie said in comments under the Saints article that salary cap will be $10M so maybe able to fit one or two in. Newton averaged 98 points across 16 SANFL games last year, should definitely be on your watchlist. Problem is he’s competing with the likes of Michie, M Jones and Riley for a spot in the 22 so is not a definite starter. However, he was pursued by the Ds, which must count for something. Yeah great call on Newton, very relevant and must watch him. Sadly couldn’t feature everyone. You highlight a great point & that is the growing depth of the Demons midfield. Good one again MJ. Already had Salem pencilled in, and according to Commissioner PB Hogan should be a lock for everybody. Put a comma in after the PB. You’ll pay $3k more for Petracca over Brayshaw, but the DPP is more than worth it. Could be this year’s Jack Billings, a premium-priced F/M who’ll get games in a rebuilding club. In saying that, Salem/Hogan/Newton/Vandenberg will get first crack at displaying some sort of scoring ability and job security at a fraction of the price. Other than that, struggling to find any upside in the midpricers and premiums, a year after Roos already inflated their numbers. Salem’s an interesting one, MJ. He wasn’t on my watchlist before your article, so I’ve had a closer look at his scores from last season. His average from 12 games was 34 (13 games for 31 includes a 0 for the North Melbourne game in round 23, which he didn’t play). His average in 6 full games was 41 (range from 23-79; he copped the green or red vest in the other 6 games played), so not much higher than his overall average. This suggests he struggled to impact in full games and was, in effect, the perfect sub as he was much more productive coming on late. Natural improvement and a full pre-season to build his tank should see a jump in his scoring next year, but he’d be a risky player to have on-field from round 1 IMO. Definitely one to watch over the pre-season.